Bo Peng holds a Bachelor of Music in Cello Performance from the University of North Texas, a Master of Music from the Eastman School of Music, and a Performer’s Diploma from the Indiana University where he studied with distinguished cellist Janos Starker. His teachers also included Steven Doane, Carter Enyeart, Marc Johnson and Eric Wilson. Bo was a two-time winner of the Music Teacher National Association Competitions (Strings Division); he also won the 3rd prize in the International Chamber Music Competition of the Czech Radio’s “Spring of Prague”. Bo has toured Japan, Taiwan, China, Canada, Europe, and the US as a soloist and with various ensembles, including the Vancouver Piano Trio, Borealis String Quartet, and the trio with Robert Rozek and Eric Wilson. He has performed Dvorak Cello Concerto with Vancouver Philharmonic and Richmond Orchestra and Chorus, Beethoven Triple Concerto with pianist Eugen Skovorodnikov and violinist Victor Kuleshov. 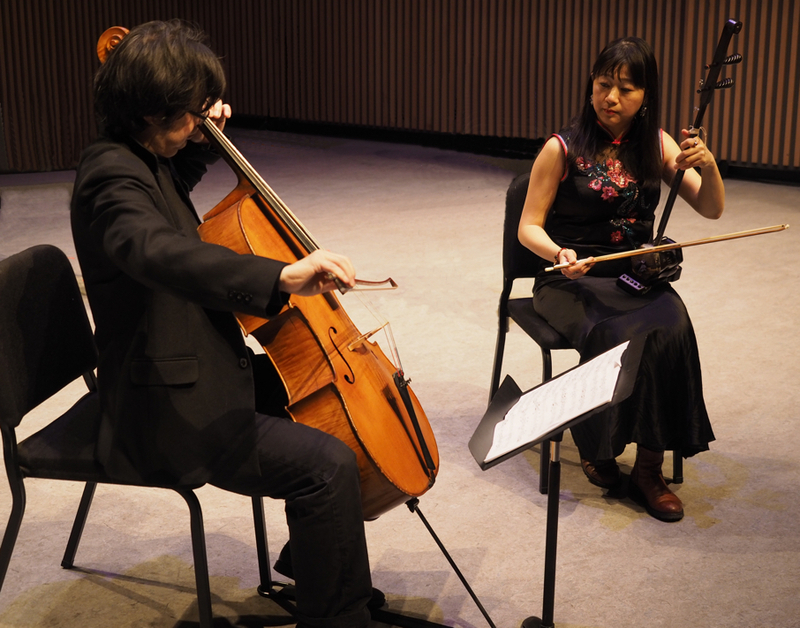 In 2012, Bo Peng was appointed the principal cellist of the Taiwan Connection Music Festival, under the directorship of violinist Nai Yuan Hu to tour throughout Taiwan. Bo has been a sectional coach of the Dallas Youth Orchestra and taught at the Dallas Private School District. Currently, he teaches at Kwantlen Polytechnical University, VSO School of Music, Richmond Music School, Delta Community School of Music, and Guildford School of Music. Since summer 2012, Bo has joined the faculty of Casalmaggiore International Music Festival in Italy. Originally from Taiwan, Lan has studied graphic score with Barry Guy, improvisation with Mary Oliver, Hindustani music with Kala Ramnath, Uyghur music with Abdukerim Osman, and Mongolian horsehead fiddle with Bayar, in addition to her studies of Chinese music since a young age. At the Vancouver Creative Music Institute (2007-2009), she has studied and performed with Han Bennink (Holland), Barry Guy, Evan Parker, John Butcher (UK), Francois Houle, Paul Plimley…etc. Jonathan, violinist, conductor, chamber musician and church organist has appeared as soloist with various orchestras and gives regular chamber and solo concerts. He has performed in many cities in North American such as Vancouver, Toronto, Montreal, New York, and in countries such as Japan, Hong Kong, and Taiwan. After graduated with Master of Music in Violin Performance from Indiana University, he has given masterclasses in many universities and became Assistant Violin Instructor at Indiana University. For the past 22 years, Mr. Der dedicated his time and energy in pedagogy, his teaching philosophy focuses on reworking students’ technical foundation and reconnecting the sound to the soul. Today, he has developed quite a number of young players into the professional world and playing in major symphony orchestras including New York Philharmonic, Concertgebuow Orchestra and Berlin Philharmonic. He is currently the Associate Conductor and Chamber Music coach for the Richmond Delta Youth Orchestra and the music director of St. Anne’s Steveston Anglican church. Cellissimo is formed by cellist Bo Peng at the Casalmaggiore International Music Festival in Italy in Summer 2012, with a varying size of 8-18 cellists, ranging from seasoned performers, talented young players, to award-winning students. Since then, every summer Bo leads a group of young cellists from all over the world for 3 weeks at this charming 13th century historical Italian old town, rehearsing and performing at cafes, cathedrals and concert halls. Cellissimo has become one of the major programs of this 20-year old major European summer music festival. Many of Cellissimo’s members are actually Vancouverites. They form an octet, the Vancouver edition of Cellissimo. 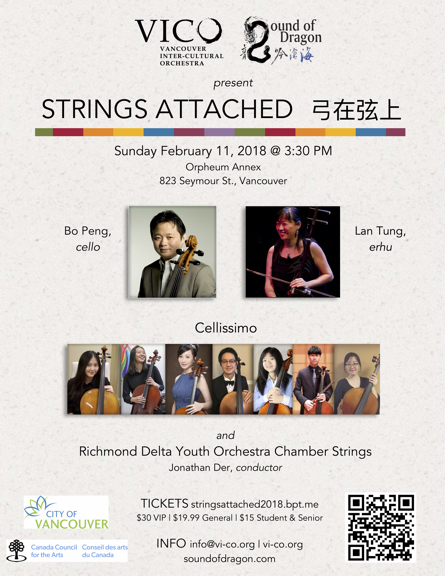 They represent the excellence of cello education in Vancouver: Bo Peng, Will Lin, Sabrina Juan, Lyla Lee, Kailey Kou, Cindy Yu, James Yang, Judy Lou. Since 1971, the Richmond Delta Youth Orchestra (RDYO) has provided a professional orchestral preparation program for young musicians. 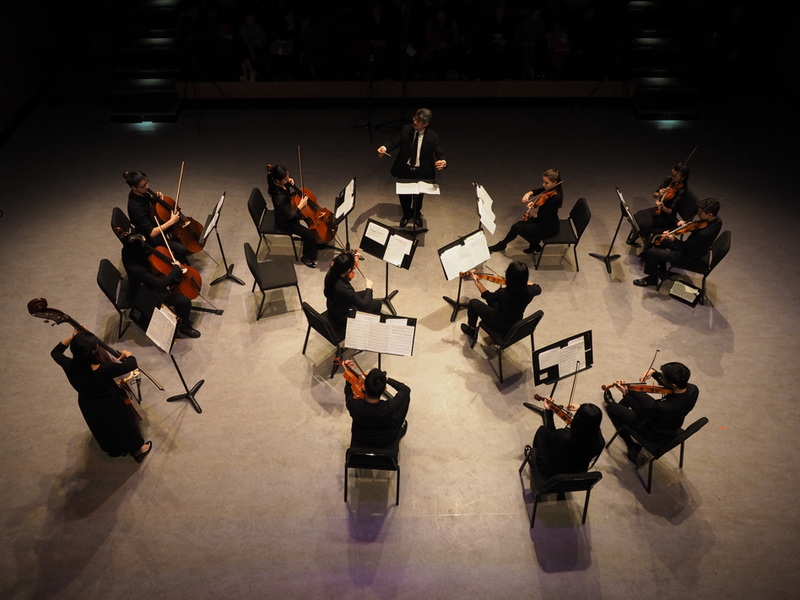 The Orchestra provides a type of musical instruction that is not commonly available for children and youth: instruction and performance opportunities in an ensemble setting. For many youth, the RDYO is a social as well as an educational opportunity, as our young musicians are able to meet other young people who share their passion for music. The Orchestra currently serves approximately 150 young musicians aged 6 to 25 in a levelled program of eight divisions: Junior, Intermediate, and Senior Strings; Junior and Senior Winds; Symphony Orchestra; Chamber program; and Jazz Ensemble.